It was not uncommon in the Middle Ages for a variety of short texts on related themes to be written as separate booklets, and later bound together, or else to be collected up and written out as a group. Sometimes, as in the present case, separate groups of texts are bound together to form a larger group. 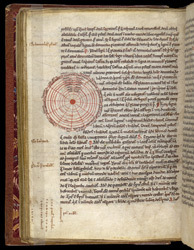 This volume contains several features pointing to the fact that it was used in Ely in the Middle Ages. William of Conches (1080-1154) studied at the cathedral school of Chartres and taught in Paris where John of Salisbury was one of his students. In his 'On Philosophy and Man', he wrote about the philosophy of Plato and how it can be read as a view of Christian mysteries. William used the idea of the world soul or demiurge, from Plato's 'Timaeus', to understand ways in which God's presence can be seen in the world, citing Acts 17:23-30, where St Paul explains the pagan idea of an anonymous divine presence as a glimpse of God's omnipresence. Here he discusses the larger structures of the heavens according to ancient theories, such as the domiciles of the planets or the zodiacal signs which 'house' the planets. The diagram shows the earth in centre with planets (including the sun) orbiting it, with the signs of the zodiac and their planets indicated at the edge.